Email communication may be facing a serious challenge from its more nonchalant counterpart social media when it comes to grabbing the bigger share of marketing traffic, but there’s no denying that the latter still has some serious catching up to do. Facebook and Twitter may help you serve subliminal imprints to a wider audience in one go, but when it comes to personalized marketing with a specific end goal, email is still the holy grail. Why, you ask? Well, for starters, it offers an unique advantage by somehow combining the ability to be more personal while simultaneously appearing to be less invasive. Alright, we’ve now established the importance of email marketing. But are you targeting your customers effectively through this channel? Email marketing is almost always treated as an afterthought, when it should really receive prime attention. Archaic strategies like non personalized, irrelevant commercial emails are equivalent to spam, plain and simple. Even in cases where these factors are improved upon, stale and generic content means the user quickly loses interest in reading through the mail completely. If all this is done well, then it’s the responsive design that is skipped, meaning people who view mails on their mobiles do not receive the same degree of personalization their desktop counterparts do. Here are a few ways we have tried to combat these challenges with our email re targeting methods, with engaging and value-adding mails that resulted in a 40% surge on open rates and 3 times as many conversions as before. SegmentationUser segmentation is crucial to understanding your user and mapping them in well-defined groups according to their behavior, preferences and attributes. This makes it easier to maintain a unique database and track a single user through the various communication channels he might interact with you on, thereby minimalising redundancy in retargeting. Categorizing them in such groups is the first step towards generating ad content that could be considered extremely specific to that particular grouping of these users, or in other words, personalization.PersonalizationIt’s important to acknowledge that some, if not most, people generally sign up for newsletters or promotions with their work email, simply because toggling between 2 or more mail email ids can get confusing. This means the content they get needs to be carefully drafted and curated, so as to ensure it’s useful enough to justify interrupting other work-related or more important mails they may be sifting through at the time.Personalization, as always, is the difference between your mail sitting there waiting for days to be opened and breaking into the user’s priority network with relevant ads. By combining intricate user data with advanced machine learning methods, it’s possible to serve content so personalized that the user won’t even have to pause to think before clicking on the link. Source : Mytotalretail.com VarietyBy tweaking your promotional campaign according to user behavior, you can also target specific sections of your users. Price drop – Trigger a mail when the price of a product previously viewed by the user drops, thus driving the possibility of the purchase up. Re-install – Find out who’s about to uninstall your app. Target those users specifically to make sure they don’t pull the plug. So what do you think? Can marketers even afford to gloss over emails as a powerful marketing tool? Write back to us at marketing@vizury.com with your thoughts and opinions. So we just got back from eTail East 2016, where we got to mix it up with the other players in the retail domain, meet potential clients face to face and build up our clientèle in the process, and the whole works. We had a pretty good time in short, so it’s only right that we put that down on paper. We kicked off with a splendid samba themed welcome, complete with Brazilian food and drinks and discussions of the Olympic games. With that out of the way, we headed to our tabletop, conveniently located at a niche location that let us interact with pretty much all the event patrons. Our marketing team came up major trumps with our drape hues, with the bright hornet-themed yellow and black proving a huge win. Now down to the nitty gritties. We quite loved talking about our push notifications, specifically the ones that include rich media content thereby bringing about a sophisticated level of personalization. We received quite a lot of interest on this, from a wide range of companies, further strengthening our belief that, if customized and used right, it offers a lot of domain flexibility. We also spent a good deal of time talking about how browser notifications could become a popular method of re targeting soon, with most of the patrons at our tabletop sharing this opinion. Captured some moments from day1 at #eTailEast . So there you go. Two days that couldn’t have gone more perfectly if we tried. Were you at eTail East as well? Tell us how that went by writing to marketing@vizury.com with your thoughts. There are over 1 billion app installs happening everyday. Go-to-App has replaced Go-to-URL for most smartphone users. Next frontier for app owners is to get users to engage with their apps often. Deep Linking is one such tool to aid that. What is Deep Linking: It’s URL equivalent for mobile Apps which helps in making user land on a specific page/screen inside an App. 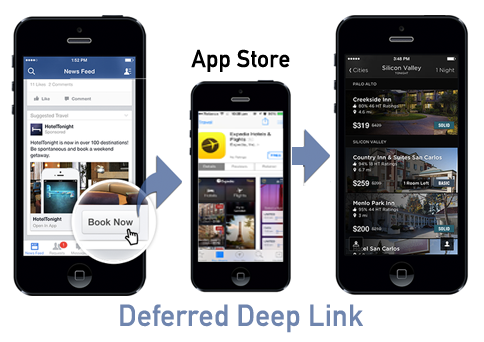 Deep link helps every App which has multiple screens, products or sections. So instead of making every user open your App’s main screen and then manually navigate, deep links can take them directly to the desired page. 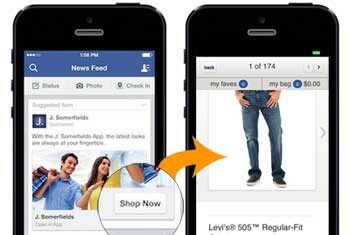 Shopping Apps: Allow users to land directly on a product page, advertised or promoted outside the app. One can create direct campaigns for individual products for better conversions. It can either be done manually for select products or by using App’s product feed to create dynamic product level retargeting similar to what we see on desktops. 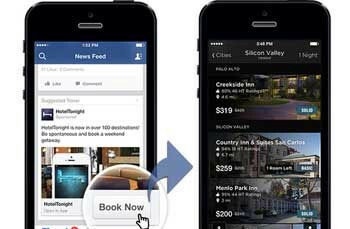 Travel Apps: Deep linking in Travel Apps can allow users to go directly to Hotels, Tickets or Holiday booking sections. Even a specific hotel deal or specific air sector could be promoted taking user to a page with those sectors or hotel details pre-filled. Boarding pass/Booked tickets can be opened directly from the confirmation email sent, allowing for faster access. 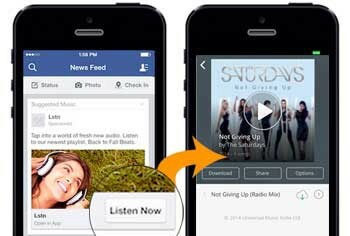 Music Apps: It can leverage the benefits of deep linking to allow App owners to push albums or hit singles directly. Imagine a campaign on Facebook using its targeting methods for all Abba Fans and clicking on it can take users directly to the collection of Abba Songs. Similarly Gaming Apps, Food Apps, News Apps would find so many use cases for it. This benefits both pre-installed app users or new users: In all the references mentioned above, you would be assuming that deep linking works only for Apps which are pre-installed on the phone. That’s a wrong assumption, deferred deep links can carry forward the saved request. If user does not have the app installed on the phone then (s)he is directed to the App store and on opening the App post installation, in the same instance, user is taken directly to the deep linked page or screen. Opportunity for new form of Advertising: Ad-Networks can also offer CPE (Cost per engagement) models in addition to CPI (Cost per install) allowing advertisers to run campaigns to get back their existing users or directly engage new users. Some networks have already started rolling this model for advertisers by integrating with their product feed and serve a product based advts based on in-app behavior. Affiliates who have helped desktop commerce in a big way can now finally replicate the same model on mobile using attribution + deep links. Most analytics tools will allow you to measure conversions through deep links using an event to track such calls inside an app. 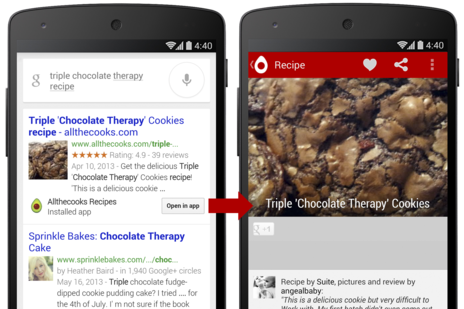 Coming Soon, Search results with deep links: Well this is the future of mobile search. Imagine you searching for best pasta in town in Google mobile search and the search result leads you directly to a page inside Yelp App listing down popular restaurants near you. This eliminates the need to maintain a mobile browser site altogether. So SEO experts will need to evolve quickly to master this search algorithm. Apps use URI (Uniform Resource Identifier) and intent filters to reach the desired page. You need to make changes to AndroidManifest.XML. You need to define format of the URI which is unique to your app. For example, youtube://, twitter://, ebay:// are URI formats for their respective apps. This link tells the phone to open a product ID 194851 inside the app and if app is not installed then take the user to app store on Paytm App page. Similarly in iOS, you can define these parameters in app’s info.plist file using Xcode editor. Even in this internet age where purchasing stuff just takes a click, compulsive shopping is a real thing and actual shopaholics aren’t just fictional movie characters. The digitally savvy among these tend to be extremely smart in their online shopping habits, and one of the most obvious things they always have an eye on is fluctuating prices on e-commerce websites. Now the kind of person who only heads over to these websites once in a while might be forgiven for thinking prices pretty much remain constant, with a negligible rise and fall every now and then. But remember that there are actual websites dedicated solely to tracking these prices on other e-commerce sites, that’s how significant this is to regular shoppers who spend more time online trying to figure out what to buy than the actual buying. When two rival websites, each with multiple resellers peddling the same product, are duking it out with each other, they each want to be seen offering the lower price. This may be dressed up as some sort of loyalty offer, a general discount or may even happen without reason or logic or any kind of intimation, often changing several times within the same day. These customized prices are also thought to depend to some extent on previous customer behavior, marked up or down accordingly. Shrewd shoppers are generally right on top of all this, but they make up just a small portion of the website’s consumer audience. How so these sites reach out to the others then? Essentially triggers to keep your customers informed at all times about dynamic price fluctuations, push notifications about price drop alerts are crucial to get your haggling customer over the line, and timely updates are important to hasten the purchase. Perhaps the best thing about these triggers is the level of personalization they afford you in order to facilitate better communication with the user and thereby a better conversion rate. The key thing to recognize, especially since we’re talking about user behavior being extremely varied, is that each consumer needs an offer tailored to their preferences in order to be persuaded. These alerts can be modified according to the percentage of price drop, as well as the number of days to wait before targeting the consumer, in order to give them a very individualized feel and stay relevant to the user you’re sending them to. The multitasker – How often does this happen? The shopper has multiple tabs open, and simply gets distracted before the transaction can be completed amd never comes back. These type of consumers just need a reminder trigger to get them to complete the purchase, so a price drop is a real bonus sweetener that is guaranteed to ensure a successful transaction. The intelligent buyer – Remember those shrewd shoppers we talked about? Well they may have figured out how to reverse engineer price drops. However, these shoppers are unlikely to adopt this tactic for products they desperately need, so manufacturing a purchase here using price drop alerts is a win-win either way. Push – Arguably the most popular of the various marketing channels, push notifications that contain information about price drop alerts are more likely to be opened on user mobiles and result in upto three times the normal conversion rate if they are designed and timed well. The ones that are deep linked and take the user directly to cart will have a more obvious chance of closing the sale successfully. Email – Email remains a great medium to inform customers about falling prices and encouraging them to make the purchase, especially for users that don’t have the app of the particular retailer installed and prefer shopping on their desktops. They also have the added advantage of affording more time to the user to make the decision, unlike the more fleeting push notification. Browser push – Another option to target consumers who spend more time on their desktops rather than the mobile, this is even more relevant if the ones you’re targeting are in turn closely tracking website prices as well using sites like camelcamelcamel or pricezombie, comparing prices across retailer brands in order to spot the best deal. For most consumers, push notifications are more an annoyance than an effective marketing or sales tool, with the typical push notification only converting about 4–8 percent of recipients. That means that, for every 100 push notifications a brand sends out, only about four to eight of them wind up being at all successful at enticing or engaging potential consumers. Consumers simply don’t engage with the average push notification that pops up on their phone. But Vizury, an omnichannel marketing platform based out of Bangalore, India, is seeking to change all that by using machine learning and Big Data analytics to help make push notifications more effective, engaging and viewed, instead of just ignored by consumers. Vizury recently introduced its latest platform, Engage Commerce, designed to spike user retention and conversion rates by blending machine learning and analytics to “deliver deeply personalized one-to-one recommendations” that can be sent individually to target specific and unique users. “The basic hypothesis with which we started Vizury as a company was that data and technology together in some meaningful way can make marketing more effective and efficient,” said Vizury Cofounder and CEO Chetan Kulkarni, adding that, when the company was founded in 2008, the process of using data to better understand consumers’ habits, trends and preferences was really in its infancy. “The whole digital data, the ability to capture it, process it and to do some interesting things around digital identity was just beginning to evolve,” Kulkarni noted. Now, Vizury works with over 600 clients in 50 countries, including brands like Sony, eBay, Citibank and Flipkart, and employs about 200 people in offices in Bangalore, San Francisco, Indonesia, Dubai and Singapore. With Engage Commerce, Kulkarni says that marketers can use the platform to target industry-specific users from whole segments of consumers all the way down to the individual level. For example, he noted, if a customer expressed interest in a pair of jeans online but didn’t purchase them at $60, marketers could use Engage Commerce to target and alert that specific customer that the price of the jeans had just been reduced to $50. Vizury says that marketers will also be able to use data on the Engage Commerce platform to predict when a user might want to uninstall the app, with an accuracy rate of a startling 83 percent. The company can then target a retention campaign for these users by “preempting uninstall behavior through the platform,” which Vizury claims results in an improved overall in-app sales rate of 20 percent. Even customers that opt to leave the app can still be targeted outside it through desktop and mobile websites and third-party apps, thanks to data collected when users engaged with the Engage Commerce app. “On push notification and browser notification, when you look at those two specific channels, they are evolving from being ‘Hi’ and ‘Hello’ sort of channels to actually rich media channels, where you can engage in a one-to-one basis through specific messages for each user,” Kulkarni said. He said that users have about a 35 percent conversion rate on push notifications sent from the Engage Commerce platform. Kulkarni said he sees “massive opportunity” for growth in U.S. mobile sales, thanks to platforms like Engage Commerce and other apps and platforms that make the mobile shopping experience more user-friendly and intuitive. Currently, Kulkarni noted, mobile sales in the U.S. only amount to about 10–20 percent of all online transactions, compared to Eastern countries, like China, India and Singapore, that have adopted the trend more quickly and see mobile online sales rates at 50–60 percent. In banking, financial services and insurance there aren’t too many products on the shelf. Every product however can be potentially signed-up by prospect customers for plethora of personal reasons. Personal loans are signed up for many needs in life, Life/ Health cover is obtained for needs that may not be connected to self at all, and so on. But how many times do we see these amazing contextual conversations in execution at real-time in BFSI? BFSI digital marketers still struggle with an ability to build super-customized at the same time consistent conversations for existing customers and new prospects distinctly across channels. So how does one ensure that their Omni-channel personalization will indeed be firing accurately every single time and getting them that incremental digital business? At the heart of Omni-channel personalization should be an innate ability to capture the intent of prospect buyers across different digital touch points. This would form the basis to predict buyer’s inherent needs, map specific product features and thereby create 1 to 1 custom offerings. Next is a platform that can fire these custom communications across channels without lag and consumes the performance over a feedback loop. At the time when digital marketers are pressed to drive performance everyday on every dollar spent, a good marketer driven technology should not take more than 4-5 weeks to execute on at least 60% of such use cases. Plus its our digital right to have an ability to quantify, compare and control the cost of acquisition from day 1 with such a technology for each channel and for each conversation. A pure digital perspective (1 Bit Engineering + 1 Bit Analytics + 3 Bit Marketing) would certainly help while acquiring and setting up a Data and Marketing Platform with Omni-Channel Personalization in BFSI. Write back to vishal.c@vizury.com to let me know your thoughts on personalization in BFSI. The banking, insurance and financial services industries are undeniably undergoing a digital transformation as we speak. Marketers in BFSI are high pressed to drive revenue from digital channels as opposed to a few years back when their sole focus was the brand. Consumers these days access BFSI brands through several touchpoints – online and offline. It is imperative for marketers to create a consistent, relevant and personalized experience for their users across all channels. If you are a digital marketer of a bank, insurance or financial services company with an ultimatum to drive digital revenue, you should definitely get your hands on these resources. They will serve as the perfect starting point for you to comprehend the task at your hand and the enormous revenue potential of your digital channels such as your Website, Facebook, Display, Email, Push and SMS. It is, in fact the ultimate BFSI marketing kit. This guide takes you through 16 steps, one at a time, on how you should gather online and offline data to get a unified view of your user and personalize messaging across various digital channels to drive revenue. The two key sources of revenue for a Banking marketer are from New-To-Bank users and Existing customers. Here are a list of 4 unique use cases on how you can create a relevant experience for your NTB users and push them quicker down the sales funnel. Identifying existing customers from your pool of website visitors and being able to upsell/cross-sell relevant products and services is indispensable to boost retention and drive incremental revenue. An intelligent marketer would make the best use of his ‘owned’ channels to engage with his users before venturing ‘paid’ avenues. Your website is your primary digital asset and it doesn’t cost you marketing dollars to contextualise conversations with users. Discover 6 unique ways in which you can personalize messaging for your website visitors – existing customers and new users – and grow your digital revenue at optimized costs. Write to us at marketing@vizury.com about your story as a BFSI marketer. Perhaps, “Crossing the Chasm”, written by Geoffrey A. Moore, is one of the milestone references for all marketers. Almost every CEO, VP, VC and Marketer keep quoting its beauty. It happens because if you dig deep you find it universal in nature. Its applications are amazing to the fact that you can attach it to numbers. Since the original graph is focused towards the adoption of high-tech products by a ‘psychographic segment’ (i.e. segment with defined psychology and demography). It can easily be replicated towards the app adoption or app retention cycle. You might be open to argue that the law applies to discontinuous innovation not continuous innovation. Understanding each segment is the vital need to understand the app retention cycle. This is the most enthusiastic segment of the user base. These are the people who download your mobile application before anyone else does. They actually spend time searching your app, all you have to do ‘make it searchable’. It happens because technology and ‘new experience’ is the part of their life, regardless of realizing what problem it solves. This segment of users normally has higher acquisition cost because of the nature of exploring new apps and less demand and buying habit. They are always curious with any new product and service and often make a small purchase with it. They explore the new app features, UI, UX and way you deliver it. There are not very many innovators in any given market segment, but retaining them over a period of time is actually the key to assuring other prospects that the product does work. They write feedback and reviews for your product. Do not hide anything, this is the phase where truth makes to the market. They do the most important job of matching your product with a strategic business opportunity. They also like to test new applications and buy into them but they care least about the anatomy and technology behind it. These users find it easy to understand the value proposition of your mobile application. It is easy for these users to understand any feature in your app and relate it to their other problems. Whenever they find a strong match with their expectation they are ready to spend their money. They don’t need a reference or review to make their first purchase. Retaining them is the key to opening up the early majority. Tell them ‘how you did it?’. They love a good story. Innovators like new and cool products that can hardly be translated into value and benefits. Early adopters want competitive advantage. Mobile app must be designed to enable a valuable overlap. They do have some common characters of early adopters. They also like new but they relate everything to the practicality. They know that these new application and product will not be able to survive the first fad and big fat marketing campaign. So they sit and look up to other customers and their experience. There are so many people in this segment—roughly one-third of the whole adoption life cycle — winning their business is key to any substantial profits and growth. The ‘pragmatists’ will use the app that are already used by other pragmatists. They generally look up to each other as reference. Get them use your app is the real key here. They are like your average customers. They start buying your product if enough number of people are using it. They wait until something has become an established standard, and even then they want to see lots of support and tend to buy. These are the people who hardly use app after years of marketing campaign. They only use your mobile app when there is no other option in market is available. Laggards are generally regarded as not worth pursuing on any other basis. You know these guys who downloaded an app because they will look to buy a product that was not on the market. It is right to say that mobile commerce is still a part of early adopter market. It (mobile + web) hardly contribute to 8% of total retail market. It leads to the conclusion that marketer should focus more on customer retention and control acquisition rate. There is no positioning in the market (Not becoming a benchmark in your category). It is important to position your mobile app on competitive positioning compass. Your app doesn’t excel at any one task. Your app doesn’t have a strong onboarding process. Users are forced to login without first receiving value. Your app asks for unnecessary (or poorly explained) permissions. In Short: Entire focus must turn towards a single segment with a compelling reason to buy, develope a whole product, become market leader. With accountability expectations on the rise, 54% of CMOs identified meeting revenue targets as their most important business driver. Meeting profit targets (16%), increasing shareholder value (13%), and growing market share (13%) round out the list of objectives to which they map performance. While business-to-consumer (B2C) and business-to-business (B2B) respondents both work toward top-line results, B2B CMOs are much more profit aware (22%) than their B2C peers (10%). The tight alignment of marketing objectives is to increase revenue growth by finding new customers or expanding product offerings. To drive new business growth, the CMOs have started to assume responsibility for a Research and Development (R&D) function that serves as a business innovation incubator developing and commercializing new products and business models. Siloed access to data and systems limits progress. CMOs are recognizing that effective customer engagement requires technology. The power and speed of technology will be a key differentiator for businesses, and CMOs are taking notice. Evolved CMOs must collaborate with their CIOs to build a digital technology vision, outline the priorities, and jointly lead marketing technology implementation. To ensure marketing technology purchase decisions integrate with the wider enterprise technology infrastructure, many of CMOs partner with the CIO when procuring marketing technology. With marketing now requiring technology to run, CMOs who are not engaged in marketing technology are abdicating their success to others. These CMOs must prioritize involvement in technology evaluation and decisions or get left behind by nimbler technology-minded peers. Take the first steps by adding a marketing technologist to your team to clearly set business requirements and translate them to the technology and marketing organizations. Write to us at marketing@vizury.com with your thoughts on the new age CMO.